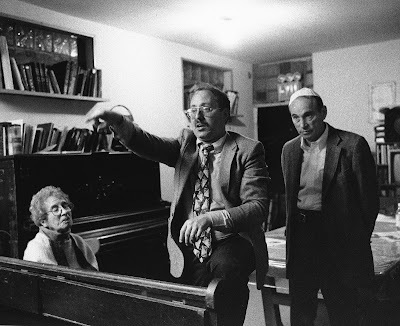 Mr. Levy came to the East Village one night in the late nineties to Rabbi Fried's 8th Street Shul at 317 east 8th st. . Rabbi Fried , who routinely wore an entertainingly parti-colored (nearly psychedelic) yarmulke and who was also several months later arrested for possession of "medical" marijuana , ran a sort of ecumenical alternative shul in this venerable neighborhood synagogue . Mr. Levy had come to the shul to warn the neighborhood of Nazis and members of other extremist organizations such as the "National Alliance" that were in their midst . Describing in detail the threat he also displayed video's of his "troops" practicing , shooting-up the Nevada desert with fully automatic weapons . He was also likely very interested in raising money to support his para-military operations . The event was attended by a broad selection of Jews , young and old ; from the very ultra-orthodox , Hasidic members were there , to the purely secular including a couple of old-style Trotskyists whose concerns he spent a good bit of time entertaining . Numerous non-jews were also present . Those in attendence were from the neighborhood as well as from all the far corners the NYC metro area . As anyone familiar with NMNL knows his target subjects did exist .